allround geek: Geeking out: Ridley Scott sci-fi double feature. Geeking out: Ridley Scott sci-fi double feature. Last night I went by a friend's place to hang out and ended up watching two of the greatest science fiction films ever made, Alien (the Directors Cut) and Blade Runner (the Final Cut). 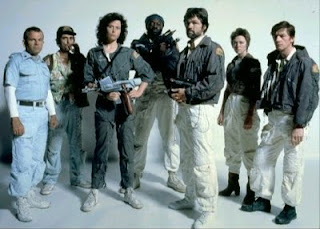 The crew of the Nostromo. As we were sitting there we decided to watch a movie and immediately a problem emerged. You see when 4 film geeks get together to watch a film, it's not always easy to decide what that film should be, since between the four of us we have watched a very large number of movies. But then the host said: "What about Alien?" Since none of us had watched it in quite a long time and we all love sci fi, our little problem was solved. Upon finishing that movie we decided to make it a double feature. And what better way* to follow up Alien than Ridley Scott's next film, Blade Runner. Especially when it's the Final Cut which none of us had ever watched before. Watching those two films after such a long time, sure makes you realize they deserve all the praise they get and why they are considered classics of not just science fiction, but cinema in general! PS. A little fun detail we spotted: a screen readout as Ripley is leaving with the shuttle from the Nostromo is exactly the same as a screen readout in the Police car as Gaff is picking up Deckard from the noodles place. Both screens say ENVIRON CTR PURGE 24556 DR 5. And here are the screenshots to prove it! *OK, maybe Aliens, but a) we didn't have it and b) it was the obvious choice. I have to say that we had great time. there was heavy commentary on both films throughout. When we noticed the same computer scene we were like...."wtf? Did we see that?" Naturally we had to check it! Two fantastic SciFi films by Ridley Scott. 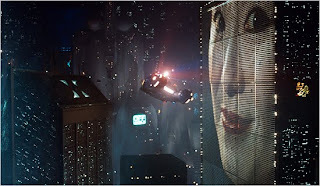 My favourite of the two has to be Blade Runner, probably due to this Film Noir, rainy, distopian feeling. So do androids dream of electric sheep? Hello,For a filmmaker who's so firmly connected with the science-fiction genre,Ridley Scott has had a shockingly negligible output in the enclosure as far as sheer numbers.His contribution to and impact on the genre has been unquestionable, and he ranks up there with Kubrick,Lucas,Spielberg and Cameron as far as molding modern science fiction.Thank you.